Sa tulong ng Pantawid lalo na ang Family Development Session ay nabuksan ang aking isipan at magsimulang mangarap na kailangang makapagtapos sa pag-aaral ang aking mga anak. Nasa kolehiyo na ang dalawa kong anak ngayon at ang aming panganay ay iskolar ng ESGPPA (Expanded Students Grants Program for Poverty Alleviation). Dati ay nahihirapan kami sa pagtustos sa pag-aaral nila ngunit nang dumating ang Pantawid ay nabigyan kami ng kaganaan at pag-asa na mabago ang aming buhay. Kaya namin ang pagbabago! -Rhemariane Antonio, 2nd runner-up winner 2015 Huwarang Pantawid Pamilya. City of San Fernando More than 300 government employees and representatives from non-government organizations (NGOs) converged during the inter-agency flag raising and candle lighting ceremony in observance of the 2015 Family Week Celebration held on September 21, 2015 at the NEDA covered court in this city. 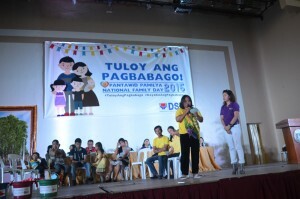 With this year’s theme, “Gender Equality and Children’s Rights in Contemporary Families,” various activities initiated by the Regional Steering Committee for the 2015 Family Week Celebration were conducted in the region. This year’s theme focuses on the conduct of advocacy activities to heighten the awareness of the public on the celebration of the Filipino Family Week. The celebration is pursuant to Proclamation Nos. 60 and 847 declaring the last week of September as Family Week and the last Sunday of September as Family Thanksgiving Day. Gabuya also acknowledged some children in conflict with the law (CICL) from the Regional Rehabilitation Center for Youth who rendered the doxology and the singing of the National Anthem. “Minsan sa kanilang buhay sila ay nagkaroon ng suliranin sa batas ngunit sila ay binigyan ng pagkakataon ng ating pamahalaan upang magbagong buhay. Nakita natin ang kumpiyansa sa kanilang sarili sa pagharap sa atin ngayon. Bigyan natin sila ng chance at tanggapin sa kanilang komunidad. Sila ay maaaring maging potential leader, maging mabuting ama,” Gabuya said. Gabuya also called on the participants to give chance to the abandoned, orphaned and neglected children of the Reception and Study Center for Children to have permanent or foster families. “Help us advocate to your friends in your communities who are willing to share their families either permanently or temporarily during Christmas. “Minsan nalabag ang kanilang karapatan ng kanilang mga pamilya,” Gabuya said while referring to some children of RSCC who earlier rendered a special number. There will be no abandoned or neglected children if the foundation of their families are strong and able to promote the rights of their children, Gabuya stressed. Norma Garcia, a Pantawid Pamilyang Pilipino Program beneficiary is one of the recipients of Cash Assistance from Bottom-Up-Budgeting (BUB) under the Sustainable Livelihood Program (SLP) of Department of Social Welfare and Development (DSWD). The Municipality of Apalit, Pampanga was allotted P1.7M BUB budget for 2014 which was used as Capital Assistance for 183 Pantawid Pamilya beneficiaries, 11 non-Pantawid Pamilya beneficiaries and 53 solo parents. The awarding, which was held on January 23, 2015 was led by Vice-Mayor Pedro Nucom with MSWDO Harley Cortez, Municipal Treasurer Elizabeth Bustamante, and Joana Timbol, DSWD SLP Field Project Development Officer. Norma, 49 years old and married with eight children, is a Pantawid Pamilya Beneficiary since 2012. All her children were able to study with the help of the program. Her four children finished high school while the other four are still in school. The eldest, Norbert who is 27 years old now works abroad as a massage therapist and helps the family in their everyday expenses. Her second child, Zorren, 25, is already married while Robert, 23, works as a construction worker like his father. Maria Jane, 21, helps her mother do the household chores. Norma’s husband earns Php2, 000.00 a week, which according to her, cannot support the basic needs of the family. She helps her husband by selling rice cakes in their barangay and earns from Php 1,000.00 to Php 3,000.00 when there are order of rice cakes which is on an irregular basis. “Nagsimulang magbago ang buhay namin noong nakasama ako sa mga napahiram ng puhunan sa tulong ng BUB-SLP capital assistance. Nakatanggap ako ng P5,000.00 at ito ay ibinili ko ng oven na ginagamit ngayon sa pagluluto ng kakanin at hindi na ako napapaso sa uling na dati kong ginagamit,” Norma said. Aside from being a housewife, mother and a vendor of rice cakes, Norma is also an active Pantawid Pamilya parent leader and treasurer of the Matapat Group under the BUB-SLP. She was also a Barangay Health Worker of Barangay Cansinala, Apalit, Pampanga. “Marami akong ginagawa para sa pamilya ko at bilang parent leader pero suportado ako ng aking pamilya,” she said. Her son, Robert is also a beneficiary of the Skills Training program under the DSWD-SLP in partnership with Arayat Institute Technology and Trade (AITT). He was one of the first batch of graduates who studied Shield Metal Arch Welding NCII (National Certificate II) held in Apalit from January 21 to February 10, 2015 and graduated on April 16, 2015. Robert is now planning to work abroad to use his welding skills and help his family. Alipio Viloria proudly said this during the Municipal Inter-barangay Forum – Participatory Resource Allocation held last May, where they ranked number one (1). Their proposed sub-project, which is Communal irrigation System will control the flood in the village during rainy season. 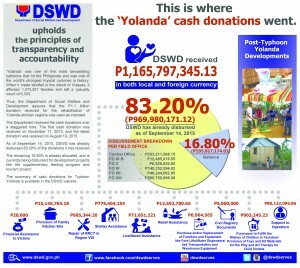 With a total of Php 9,119,200.00 from DSWD Grant and Php 156,500.00 from the Local Counterpart Contribution, this project is set to start early August once the money has been downloaded to their Barangay bank account. Villoria, 47 years old and married with three children, is farmer and as a part time tricycle driver. He has also served his village by being a village police. “Simula ng maging volunteer ako sa KALAHI-CIDSS, nagbago na aking pananaw sa buhay. Hindi ko inakalang may magagawa ako para sa aking barangay. “said Villoria. For him, learning how to process documents, procurement and taxes are some of his great experiences during the seminars and workshops that the program provided. He did not expect that he will experience attending such activities because he did not even finish elementary. “Never in my wildest dreams that I will get the chance to sit down with the people who work for the government and at the same time to create our own project proposals,” he said. With these, he gained self-confidence; he was able to talk in front of a big crowd while discussing their project proposal with confidence. Now, he believes that he can do much better than being a farmer and a driver. Their village is situated in a low lying area and during rainy season, the residents experience heavy floods. There were times when they experienced strong floods which resulted to some casualties. There was an instance wherein 10 people from the village were drowned because of heavy rains. Five survived and the other five were dead and Villoria’s brother was one of them. Since then, when heavy rains or typhoons occur, he gets worried for their safety. Sixty four thousand two hundred eighty eight older persons from Central Luzon are beneficiaries of the Social Pension Program of the Government for 2015. Mary Jean Balico, Social Pension Program focal person said that the Department of Social Welfare and Development Field Office III (DSWD FO III) has already scheduled the payout starting July 21. 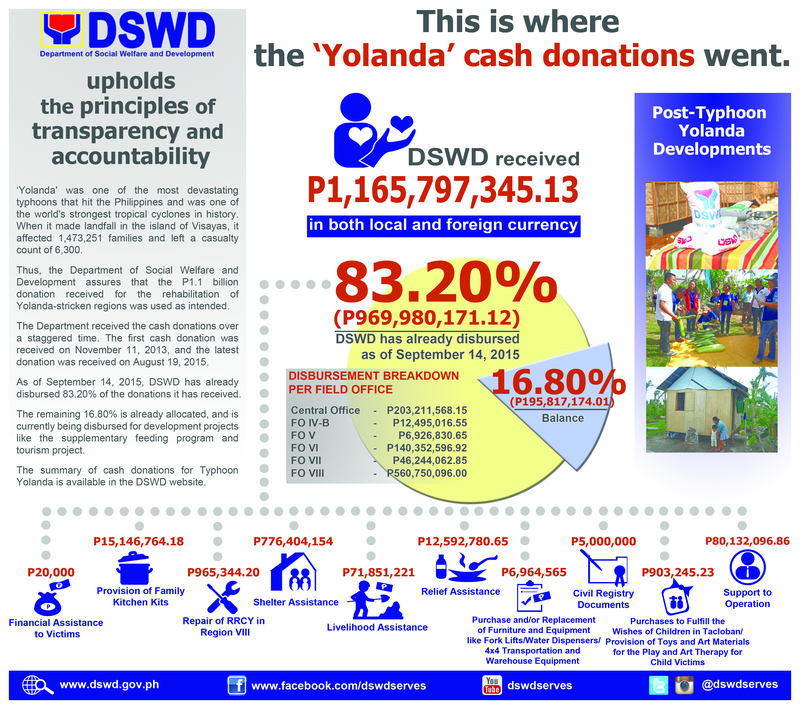 DSWD FO III will disburse the amount of P123,231,500 stipend to seniors aged 65 and above who were identified based on the result of the data generated by the Listahanan or National Household Targeting System for Poverty Reduction (NHTS-PR) of the DSWD. Of the 64,288 beneficiaries, 46,419 are existing pensioners who will receive P1,500.00 for the months of April-June while 13,957 who are additional beneficiaries for 2015 will receive P3,000.00 each for the months of January-June. The remaining 3,912 seniors are replacements of those seniors who were dropped from the list due to death, transfer of residence, unlocated, or found out to be beneficiaries of other social insurance system. The provision of the P500 monthly social pension to indigent senior citizens is provided under Republic Act No. 9994, also known as the “Expanded Senior Citizens Act of 2010.” Under the law, indigent senior citizens shall be entitled to a monthly social pension of P500 to augment their daily subsistence and other medical needs. Under the operational guidelines issued by the DSWD, senior citizens who are 65 years old and above and who meet the eligibility criteria will benefit from this program. All qualified senior citizens shall receive their P500 monthly social pension on a quarterly basis. (Meycauayan City, Bulacan) The DSWD Municipal Action Team assesses the families who are evacuated staying at Malhacan Elementary School, Malhakan in this city. The team uses the Disaster Assistance and Family Access Card (DAFAC) in assessing the 13 families or 65 persons who are affected by typhoon Falcon which occurred on July 8. The DAFAC aims to validate the status of affected families and will also serve as reference for the provision of additional and appropriate interventions.